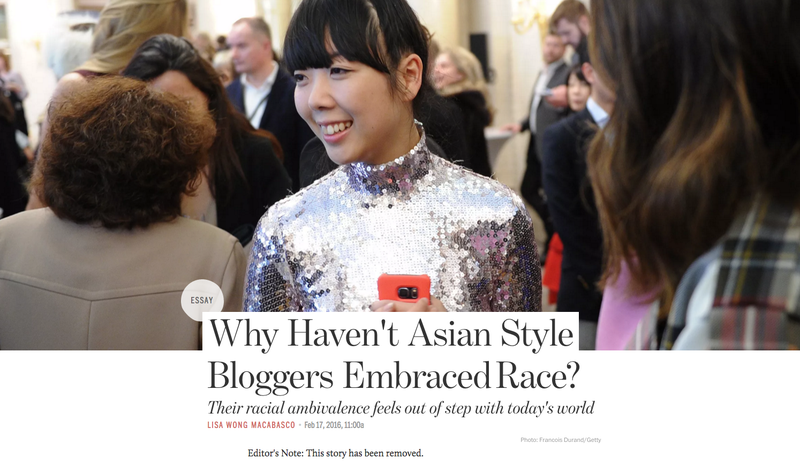 Why Did Racked Delete an Essay About Asian Style Bloggers and Their 'Racial Ambivalence'? On Wednesday morning, Racked published an article by Lisa Wong Macabasco about the prominence of Asian style bloggers and the purported lack of prominence of their race. The answer, I thought, reading the piece, sits somewhere between truth and projection—and probably closer to the latter than the first. But no one would’ve had much time to think about it, because just an hour later, Racked had deleted the story (and the tweets associated), replacing it with a terse note. The story is still cached, and I revisited it this morning. Macabasco gives plenty of background for her conclusion before she gets to it. She writes about the relatively swift transition between 2000, when the association between Asian people and fashion was limited to sweatshop protests and offensive Abercrombie tees, and the 2007-2010 period, when Derek Lam, Phillip Lim, and Thakoon Panichgul rose to prominence, along with fashion bloggers like Susie Bubble and Rumi Neely. Well, not so fast, shall we? The stuff about face-obscuring and style choices aside—it seems to me that two main tenets of style blogging are posing oddly and aiming for aesthetic unexpectedness—Susie Bubble was born in the UK. She is ethnically Chinese. She does not “really” consider herself to be a “Chinese blogger,” presumably because she doesn’t blog extensively about race or the country where her parents came from. Is this bad? Is it “racial distancing”? Does Susie Bubble have the automatic obligation to blog about race—a task that is, like fashion blogging, intriguing to amateurs but quite difficult to actually do well—just because she’s Chinese? Let’s swerve to another example, one I can speak on with authority, which is me. I am ethnically Filipina, born in Canada and raised in Texas, within an all-white community that I would not have chosen for myself but was fated for anyway, by parents who spoke almost exclusively English at home. If someone emailed me asking to “analyze what I did from an Asian perspective,” and I said “I don’t really label myself as this Asian blogger,” would I be distancing myself from my background or accurately representing the role that my Asian background has played in my life? I’d probably word my reply differently, but “I don’t really label myself as this Asian blogger” is in spirit fairly close to what I would say—even though my critical consciousness has been shaped by a deep personal understanding of white supremacy, and even though I write about race from a minority perspective all the goddamn time. There are a lot of straightforwardly non-traitorous reasons why a person would want to say “I don’t really label myself as this [X] [something],” anyway. For me, I describe myself as a “writer,” not a “feminist writer” or an “intersectional feminist writer” or an “Asian writer” or a “woman of color writer,” because I find life more palatable when I insist, even privately, that any of those things could be folded into the default. I’m excited to see models like Liu Wen, who has been featured in Gap and J.Crew campaigns, Fei Fei Sun, the first Asian model to grace the cover of Italian Vogue solo (and what a stunner it was! ), and Xiao Wen Ju, the newest face of L’Oréal Paris. Being of Filipino heritage as well, I’m also super into up-and-coming Filipino models like Paolo Roldan and Marga Esquivel. Filipino fashion models! What a world. These days, we see stars like Amandla Stenberg taking a stand against cultural appropriation. We see models of color addressing racial bias backstage, from Brandee Brown speaking out about stylists who don’t know how to work with black hair like hers, to Nykhor Paul, who is Sudanese, posting on Instagram about needing to bring her own makeup to shows. In other words, if they are non-white, models and fashion bloggers can’t just be pretty and stylish; now, they have to be woke. If Asians sometimes remain silent in the face of racism, and if some seem to work unusually hard in the face of this difficult history, it is not because they want to be part of a “model minority” but because they have often had no other choice. Racked is a Vox Media property, just like SB Nation, which deleted a piece yesterday too.